First full week of 2014 which is last week has just passed. What a way to enter into 2014 with more screwups by the obscenely overpaid hybrid regime & acknowledgements of rot taking place which they are unable to hide. Nothing new here. News of insufficient beds have been surfacing for quite some time in social political sites & forums. I have a personal taste of it as well when my mum was hospitalized due to pancreatitis in Dec 2012. Again, i'm stressing that it is a deliberate attempt by the hybrid regime to screw the masses with insufficient medical facilities. 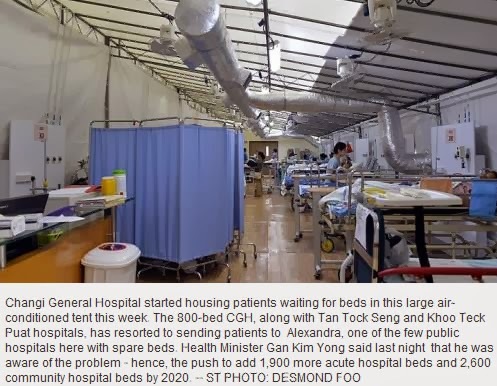 There is no water or electricity shortage despite the population explosion yet shortage of hospital beds? The boss is a grassroot leader of the current ruling political party. Though i loathe the party, the supermarket boss is someone i respect. He & his siblings built up their supermarket business catering to the peasants unlike the fake worker union supermarket chain. Listed his cellphone number at every outlet for public to give feedback. I'm sure he got a lot of spams especially from insurance/property sellers. How many of those scholars CEOs which the hybrid regime parachuted into govt-linked companies list their contact no. for public feedback? Still lives in peasant dwelling (hdb flat) despite being top 50 richest man in this country. Treats employees well. It was reported that meals are provided for employees. Not sure if it still goes on today. The boss cited that his frequent appearance on his supermarket tv variety show to present prizes may have contributed to the kidnapping for ransom. I think the kidnapping which is so rare in Sillypore has shown that the social fabric gap between the well-off & poor has reached a new high. Sillypore society has become unstable. Though the kidnappers are dumb in their attempt, there are no shortage of smarter ones retaliating against those exploitative bosses. In those up-market restaurants serving the wealthy, those poorly paid cooks, waiters/waitresses etc can deliver "extra personal ingredients" into the food & drinks. Or those treated-like-dirt mechanics servicing the cars of exploitative/look down upon them elites by rubbing a coating of saliva on the steering wheel and/or seat cover. Extra service for snobbish attitude. Peasants have already lost count of the number of breakdowns taking place in recent years. 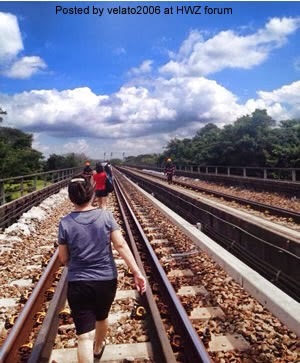 The most iconic picture is this walking the line towards Kranji station which the govt-controlled paper used in their attempt to entice people into buying their propaganda filled paper. 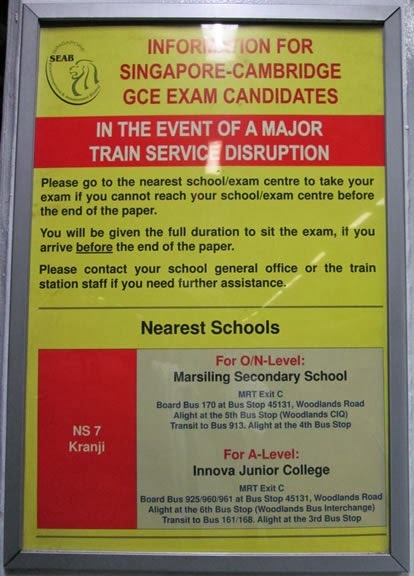 Such notices are put up on every train station with their nearest exam venues..
State capitalism at its best through cancerous growth approach being advertised to the world. Thank you for your updates from the ground. I've only left Singapore for 3+ years but it seems like so many things broken down since.